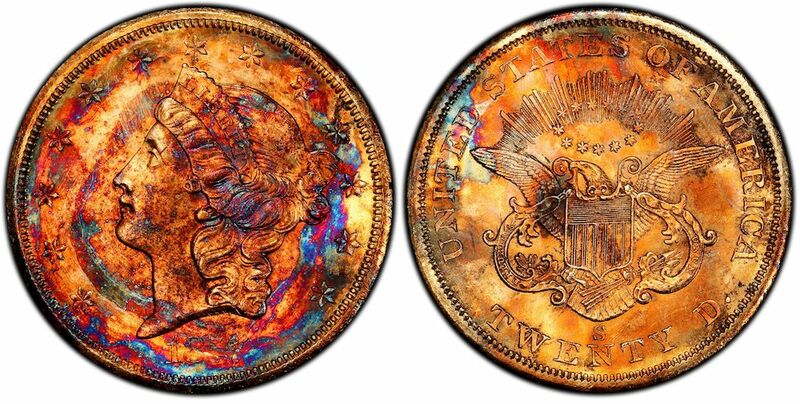 (Lincroft, New Jersey) March 6, 2019 – The spectacular 1857-S Double Eagle, recovered in 2014 from the fabled S.S. Central America and now nicknamed “Supernova” because of its amazing, unique natural toning, will be offered to the public for the first time through Legend Rare Coin Auctions (www.LegendAuctions.com). The amazingly toned S.S. Central America “Supernova” 1857-S Double Eagle. “I was beyond thrilled when the coin was consigned to Legend Auctions. When it arrived, the magnificent colors were so overwhelming tbest-tonedds started shaking holding the coin! This is by far the best toned gold piece I have ever seen,” stated Legend Auctions President Laura Sperber. Graded PCGS MS67, the coin displays a mixture of vibrant red and deep blue hues over much of its lustrous gold obverse surface as well as remarkable blue and red toning on the reverse. It will be displayed at the upcoming PCGS Members Only Show at The Cosmopolitan Hotel in Las Vegas, March 20-22, and then offered by Legend in their Regency 32 auction at the PCGS show in New Orleans on May 16. “It is the most beautifully toned gold coin ever seen! It has amazing blasts of colors, so we named it ‘Supernova’ after something truly cosmic,” explained Dwight Manley, managing partner of the California Gold Marketing Group (CGMG) which consigned the coin to Legend. CGMG acquired it and other sunken treasure brought up in 2014 from Ira Owen Kane, Receiver for Recovery Limited Partnership and Columbus Exploration, LLC in a court-approved transaction. CGMG earlier acquired all of the available treasure that was recovered in the late 1980s. Known as the “Ship of Gold,” the S.S. Central America sank in a hurricane in September 1857 off the coast of North Carolina while carrying tons of California Gold Rush coins and gold ingots. There were 578 passengers and crew onboard, but only 153 survived. The “Supernova” Double Eagle and all the other S.S. Central America coins recovered over the decades have been authenticated and certified by Professional Coin Grading Service (www.PCGS.com). “PCGS was tremendously honored to examine and grade this particular coin MS67. Like the cherished ‘Heart of the Ocean’ diamond in the famed movie, Titanic, this coin represents the crown jewel of the S.S. Central America treasures,” stated PCGS President Brett Charville. The coin was discovered more than 7,000 feet below the surface of the Atlantic Ocean in the commercial shipment area near the stern of the shipwreck. It was among piles and stacks of coins that originally were in boxes of Double Eagles being shipped to New York by San Francisco businesses. For additional information about the coin, contact Legend Rare Coin Auctions at 732-935-1168 or by email at info@LegendAuctions.com.